Looking for coffee mug gifts to make for Christmas or other special occasions? 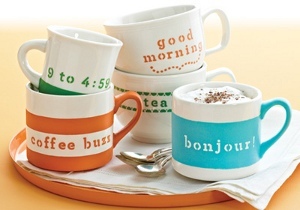 Try these Martha Stewart Coffee Mugs, and you'll have a stylish homemade gift in just a few steps. Use a large brush and paint the surface of the mug and the handle with Mace. Paint more than one coat if necessary. Use a foam pouncer and follow general adhesive stenciling instructions to stencil "coffee time" in Mace, using the image for reference.